Yeah… I still don’t get it either; but when you’re hopped up on slurpies and skittles things are funny even if you don’t know why. Questionable humour aside, this may be my new prayer to self centering. But I’ll get to that in a minute. I don’t know when or how I lost that sense of connection and groundedness I used to have, but I know when I really started to notice it. This summer started a game I have come to call: Pass the Crazy. Everyone in my sphere has been going through some flavour of crazy-making stress, or doing some fine self-generated crazy for internal reasons, or some combination thereof. Including myself, as per being flooded out of my home. Traditionally how things work with my friends is a trading of support, when you’re in the crazy tree you reach out to somebody on the ground. Trouble was, NOBODY was on the ground. It was really just a matter of who was on a lower branch of the crazy tree. So there we sat, just passing the crazy from one branch to another. I found being a support to whoever was most crazy when I was feeling my least crazy was frustrating and exhausting, and every time we passes the crazy around there was just a little less sanity left (on accounta the losses re friction n such… SCIENCE), and as the months went on I just got feeling more and more run down. My efforts and desire to be supportive got increasingly less effective as my responses were diminishing into trying to fast forward people into the realizations that would bring them down from the crazy tree so that they would be peaceful so that I could be peaceful! And of course you can’t hurry that sort of thing, or force it at all. I wasn’t doing it right, but I really couldn’t even remember what “right” was any more anyway. Somewhere in there some intrinsic wisdom pushed me in the right direction. I fled to the hills. For the first time ever, sent myself out into the mountains to a retreat centre for contemplation and restoration. A place not for counselling or group projects but a place for quiet. Lots and lots of quiet. And napping. And reading. And walking. And staring at trees. It’s a funny thing, going out into that kind of stillness, especially when you’re driven out at your rope’s end. A willingness to just stop doing and just be, to let go of even the drive to find some sense of peace, ’cause baby you can’t MAKE that happen. But if you quit trying long enough it will happen. This place had a huge library full of books to choose from, things to read to fuel your contemplation. Somehow I knew my main problem was too much thinking already so I didn’t read much. 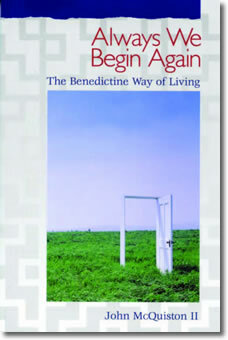 But one book I did carry with me often was a wee little thing, a modern intepretation of a sixth century Benedictine text called Always We Begin Again. Its short verses are almost poetic, and are simple phrases that can cue a whole line of thought without having to read someone else’s whole line of thought. it neither speaks nor hears. to a purpose beyond our understanding. is no less actual than ours. Those trees that I was spending so much time just sitting and staring at, that were slowly working on chilling me out, they weren’t doing anything but being trees. Their comfort for me wasn’t in their wisdom, or knowledge they held. They were just there. Present. I’d forgotten what is was like to be present, and realized a good portion of what comforted my friends wasn’t what I said, it was simply being present. And when I had lost that in myself I also lost that to offer other people. And the beauty of it is, in just being present, you just are, no matter what’s going on around you. I sat and watched trees rock and howl in a Chinook wind, unperturbed, just hanging out going: Hey I’m a tree! Stretching out shadows across moonlit snow, rendering me speechless in awe at the peace and the beauty of it. Still the tree’s just chillin’: Hey I’m a tree! The dog lumbers by on a sunny afternoon, stops, sniffs, lifts a leg: no worries ’cause Hey I’m a tree! So it really doesn’t even matter if being present brings peace to whoever I’m with, ’cause Hey I’m a tree! and will be no matter which way the wind blows (or the dog pees). It was in fact still a couple of days from this realization to the point where I actually got the peace I went out to meet. Returning home, it’s a bit shocking (okay a lot shocking) to come from a place so removed from the insanity of life, back into the city, and for me, looking at getting back into that game of Pass the Crazy. I spent the last day of my retreat pondering what re-entry was going to be like, what I was bringing back home with me. Everything in life is contextual, and we are different people in different places, but some things we can carry with us. So I thought about what I was going to carry, because I know you can’t live that kind of contemplative life at that level and still function in the mundane world (seriously they ring a bell to remind you to come in for dinner). But changes inside aren’t attached to outside things either, and you don’t have to lose them, so long as you are mindful and have some touchstones. Some little check-in habits to see: now where did I put that peace of mind thing I found before… For me, it’s a reminder to consider the silence of that tree and what that silence brings. To ask myself if I’m that tree. So go on, ask me if I’m a tree! And that silly riddle aside, if the answer’s no, it’s time to go back to the woods. Great synchronicity again…writing about being a tree…Emily Carr’s 142 birthday being celebrated at the Art Gallery of Vancouver with an exhibit of 40 Carr Paintings that she did in the BC forests. Indigenous Peoples called trees “Standing Ones”. Their strength came from their deep roots. Trees are such a vivid real reminder of how important being quietly deeply rooted. Thanks for reminding me to look out my window and contemplate the trees in my yard. I’ve been so reluctant to landscape my yard and repair a falling down wall because I want to save my mature trees. I have some kind of bond with them. When my neighbour wanted to cut the boughs on her side of the property and asked me to pay for half the cost, I refused. I couldn’t bring myself to hurt those towering pines. I also have a beautiful giant laurel willow and am trying to figure out how to save it from damage if I repair that dismal retaining wall. I didn’t understand this bond I have but maybe it’s because they are my reminders of rootedness and what can be nurtured with deep roots. Don’t forget, even the “Standing Ones” eventually come down. Napping by a fire fueled by those same trees allowed for lots of thoughts on change and loss and surrender too. Beginnings and endings all cycle within each other.